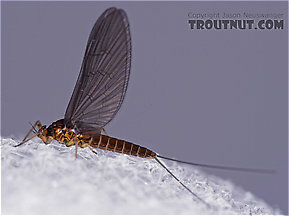 This is one of the most prolific genera of mayflies in North American trout streams. Their small size permits the growth of up to three generations per year, and they are good dry-fly insects because they often hatch in impressive numbers and the duns ride the water for a long time before taking flight. 1. Call them "Blue-Winged Olives" as most do. the problem is this name has lost all meaning due to being applied to dozens of species across several families (many of which have neither blue wings nor olive bodies). Besides, the name was originally coined for a species of British ephemerellid, the family where this common name should properly reside. 2. Call them "baetids", the Latin name for referring to members of the Baetidae family as a group. While technically accurate scientifically, it doesn't tell the listener or reader much about their appearance. 4. Call them "little (whatever color they are) quills." Perhaps this is the best choice as at least it's more accurately descriptive. The relatively new genus Fallceon has two species of interest that are made up of several previous Baetis species. They are distributed nationally and may prove significant as more is learned about the angling opportunities they present, especially in the the South and Southwest. Some Baetis species are often the first major hatches in the spring and the last in the fall, and on especially stable spring creeks they may emerge throughout the winter. The genus is common nationwide. See each species page for more on their distribution and timing. Shuck: The shed exoskeleton left over when an insect molts into its next stage or instar. Most often it describes the last nymphal or pupal skin exited during emergence into a winged adult. ), and drying their wings to take flight, which means that almost any type of surface fly has its uses. Anglers may need to use deep nymphs, floating nymphs, emergers, cripples (Cripple: In fly fishing, a cripple is any insect which has been injured or deformed so that it cannot escape the water. This may include stillborn emergers or fully emerged adults which have been damaged, often by wind or waves, so that they can no longer fly. Trout often favor eating crippled insects. ), or dun patterns during this emergence. Common wisdom says floating nymph and emerger patterns are the most useful. 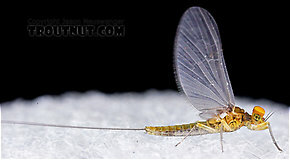 Dismal weather invites the best hatches of Baetis mayflies; look for them on overcast, rainy days, as long as the water temperature is above 40�F. Timing the return of these mayflies as spinners after they hatch is difficult; some may come back within a few hours, while others take a few days. In moving through the surface film she folds her wings about her abdomen and uses the downstream side of the object she has selected. The passing through the surface film is the critical phase of her mating. Once she is under the surface, she inspects the rock or log carefully with her abdomen. Finally she lays her eggs with a circular sweeping motion, which leaves a little row of eggs each time. When her supply of eggs is exhausted she climbs back out of the water or is swept away in the underwater currents. 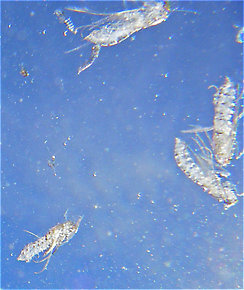 Baetis nymphs are found in almost every trout stream, but they produce more broods and thicker hatches in cold, unpolluted, alkaline (Alkaline: Having a pH higher than 7 (opposite of acidic). Moderately alkaline water is ideal for trout because it's better for the growth of phytoplankton, the usual base of the aquatic food chain, and that's good for the growth of everything higher up the chain, including trout.) waters. They inhabit almost every microhabitat in the stream except for silt beds, but gravel and vegetation are especially suitable. Because Baetis mayflies are so often called Blue-Winged Olives, some anglers try to imitate them with flies with blue wings and olive bodies. This is one of the follies of common names. Their wings are various shades of gray, maybe with a slight blue tint, and their bodies are various shades of olive or brown. When you meet a hatch, try to catch one of the live mayflies rather than assuming you know its color. 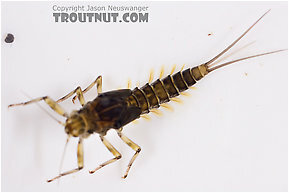 forum visitors using the Firefox browser who put troutnut.com on their bookmarks toolbar have undoubtedly noticed a tiny dark mayfly icon in a blue box next the bookmark. well, it's breeding. came back this evening from a week out of town to discover that the little troutnut computatii had a pal over next the hotmail.com bookmark where formerly there was only a generic white icon. am waiting for it to show up next the other two sites that have only generic icons. now our resident boffins will help me with the Latin ending on the new name, (i tried to use the genitive plural) and then we'll ask Jason how he got these virtual flies to multiply. Anyone have observations that they are willing to share of different flavistriga broods? Jason says that B. flavistriga is a "combination of widely varying types in different places, it's hard to piece the information together into reliable hatch dates for the different broods in any given location." This is stated very well. As part of my bug work, I'm trying to tease apart some of these "varying types" to see what, if anything, they might represent. Tapping into the experience base here might help. Alkaline: Having a pH higher than 7 (opposite of acidic). Moderately alkaline water is ideal for trout because it's better for the growth of phytoplankton, the usual base of the aquatic food chain, and that's good for the growth of everything higher up the chain, including trout. Cripples: In fly fishing, a cripple is any insect which has been injured or deformed so that it cannot escape the water. This may include stillborn emergers or fully emerged adults which have been damaged, often by wind or waves, so that they can no longer fly. Trout often favor eating crippled insects. Dead-drifting: The manner in which a fly drifts on the water when not moving by itself or by the influence of a line. Trout often prefer dead-drifting prey and imitating the dead-drift in tricky currents is a major challenge of fly fishing.